Understanding what information My Roster is telling you is a big key to success in terms of managing your fantasy teams. So what we are going to do is to break down everything you are seeing starting at the top and working our way to the bottom. The top of My Roster shows a link to league settings. This varies from sport to sport but it includes scoring settings such as PPR scoring or point per completion for NFL leagues and potential categories to select from for all other leagues. Chances are we automatically applied your league settings when you first synced your league. If not, have a look here to modify your league. 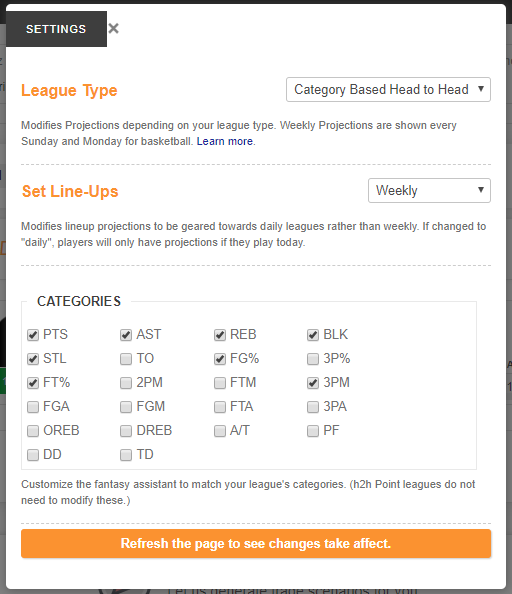 The order in which your players are listed should be exactly how your lineup is where your league is hosted. Next, you&apos;ll notice 5 column headers: OS, SLOT, NAME, TRUST, and PROJ. Let&apos;s break each one down and explain what it all means. O/S stands for OWN and START percentages. Next to each player on the left side will be a small bar indicating these percentages. You may also notice small up or down arrows next to each bar graph. This indicates where the OWN or START percentage is trending compared to last week. Pay close attention to these indicators. If other fantasy owners are losing faith in players then it&apos;ll easily show up here. You can also mouse over the bar graph to see the difference from last week. SLOT stands for the slot in which this player exists in your original lineup where your league is hosted. If these are incorrect, simply click on the position and select the proper position. If the slots are wrong, then Optimal Lineups will not work. For example, if you have a RB in a WR slot. 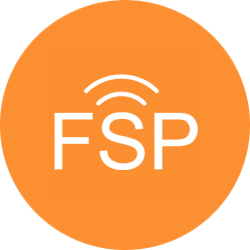 NAME is where each player is listed along with their FSP Rating, position, team, and matchup information. You can also click on any player name to pull up their pop-up window for complete stats and news about the player. You may also notice an ORANGE icon (shown above) or a BLUE icon (not pictured). These indicate if a player is HOT or COLD. The red medical icon indicates a player injury. Matchup information can be an extremely important indicator of who to start and who to sit because it shows you how tough or easy a matchup is for that particular day or week. GREEN boxes indicate easy matchups. RED boxes indicate hard matchups. These are compared against league averages across all teams and broken down by specific categories and positions. So in this particular example, Kyrie has a very favorable matchup against the Hawks on Jan 19th with steals and field goal percentages being extremely favorable for him. You can see the complete list of defensive rankings for basketball here or inside the fantasy assistant in the Research box. TRUST is a numerical value that indicates the likelihood of a player meeting or exceeding our projections. A perfect number is 100. PROJ stands for projection. The number in the gray box is their projected point value and by clicking on the projection it will take you to more in-depth information about it. The update rosters button will update your rosters immediately. This is limited to paying members only and not available during a trial. For trial members, clicking the button will add your league into the update queue and will be updated behind the scenes within a few minutes. Refresh the page to check to see if the roster was updated. 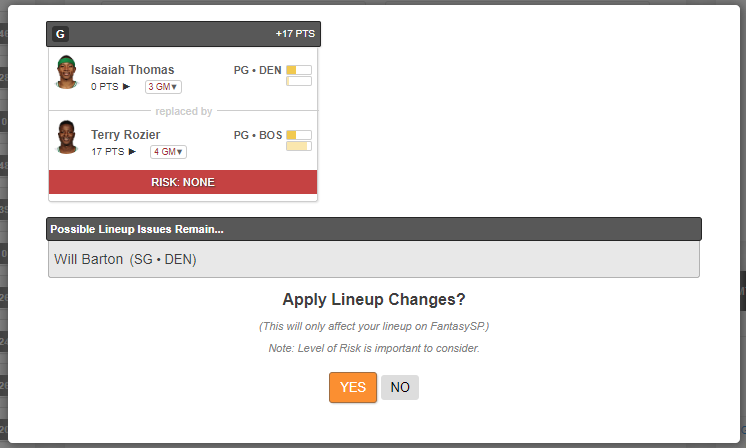 The Optimal Lineup button will make an attempt to figure out the best possible lineup by comparing your bench players with your starting players and make lineup suggestions. In this particular example it is suggesting to bench Isaiah Thomas for Terry Rozier due to injury and the fact that Thomas is projected to not play this week. Notice the RISK level in red? In this particular instance, the risk level is NONE. The RISK level can be NONE, LOW, MEDIUM, or HIGH. We recommend making starts with risk levels at MEDIUM or under. If a player has a HIGH risk level but for minimal gain in performance, then it&apos;s probably best you play it safe and do not make the start adjustment. Will Barton is also being listed as a potential problem due to the fact he is injured and may not play today with no proper bench replacement. Our projection indicates he is leaning towards not playing. At this point, you should be clicking on Will Barton to find out his latest injury news to see if he will be playing.